So here is another interesting tutorial fro Blogger, that how you can automatically add a special paragraph or some special line or Note etc. at the end of the each post and it will appear in all post page. That means if you need to add a paragraph at the end of your post/article such as you want to add an request to comment about your blog and for that you have write the same in each and every post but here is the easiest way through which you can add the same request in each and every post automatically. How to Edit Blogger HTML? Log in to your Blogger account and choose your blog. Now click on Theme (on the left sidebar). Then click on Edit HTML (Before that please backup your Blog Template). Note: Before going to the HTML editor please backup your Blogger template, it anything wrong happen you can easily restore the template. How to Add a Special Para at End Of the Post? Open Edit HTML on your blog template. Now paste the below code just below of it. If not success then you can try the second <data:post.body/> from the last. Or If you are using Social Share link or icon, then find the section in your blogger template and paste the code just above it. You can also decorate the text of your paragraph, if you need the text should be bold with justify alignment then use the following code. 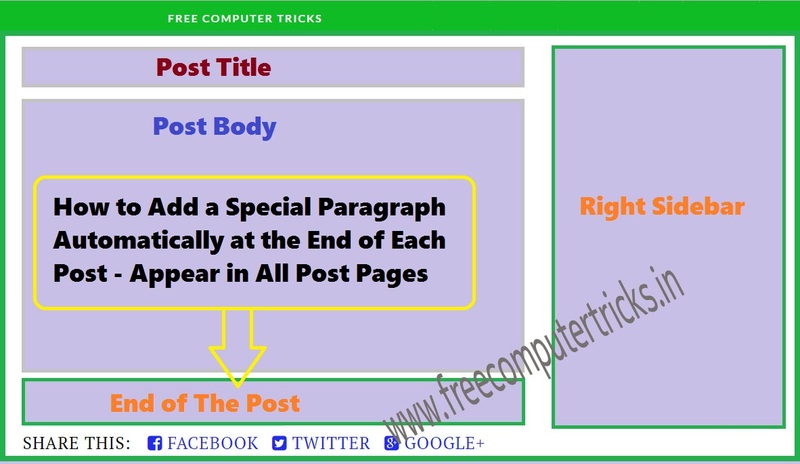 In this way you can add a special paragraph or a special Note or some words you want to add at the end of the each post. With the above condition the paragraph will appear on post page only, if you want to show the quote on your home page then just remove the <b:if cond=....> tag, write the only the paragraph.